We have released a new Modbus Module that can be added to any of the EZReporter 4.0 Editions to provide Modbus TCP Slave functionality. Most numeric results that are calculated and reported in the edition of EZReporter you are running can be assigned to a Modbus register for a Modbus Master to read. EZReporter 4.0 was completely re-written to take advantage of the latest software development technologies. While the overall “look and feel” of EZReporter 4.0 should be familiar to EZReporter 3.0 users, there are a large number of enhancements that have been made to the user interface and program functionality. For a summary of the enhancements made in EZReporter 4.0 download the software enhancements flier. *Contact Diablo Analytical for information on support for other chromatography data systems. 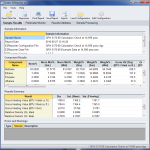 The EZReporter software includes a base reporting module and several optional modules: Natural Gas Analysis (NGA) and Natural Gas Liquids (NGL) calculation and reporting modules, and a Results Database module. 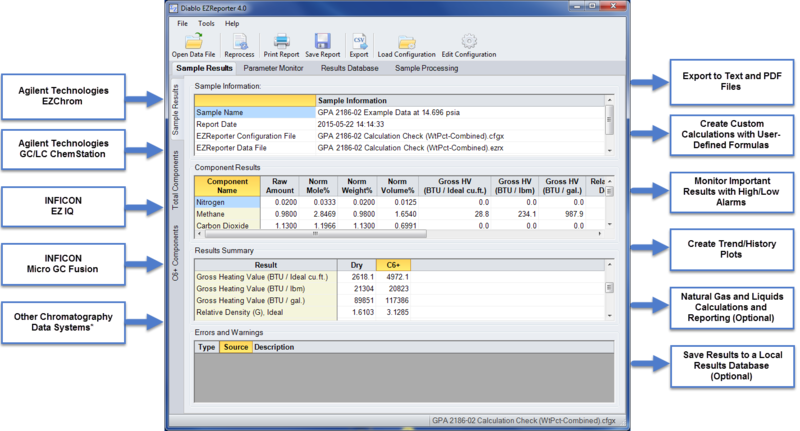 These modules are combined in several different “Editions” of the EZReporter software. All modules are present in the EZReporter program and all are active during the trial period. Once you activate the software license, only those modules that you licensed will be available. The following table lists the different editions of EZReporter 4.0 that can be licensed and the modules that are included in each of those editions. Refer to the data sheet for each module for more information on the complete feature set for that module. Part numbers and prices for new licenses and upgrades from earlier versions are provided in the EZReporter 4.0 Price List. The Data Analysis Edition allows you to edit configuration files and reprocess EZReporter data files without requiring you to pay for an instrument processing license. The Standard Edition can process calibrated peak results automatically from any supported chromatography data system. It allows for flexible reporting and exporting, parameter alarms, and history/trend plotting among other capabilities. For more information, download the Standard Edition flier. The EZReporter Natural Gas Analysis (NGA) Module is designed to perform standard Natural Gas and Refinery Gas Analysis heating value and related calculations. The results from these calculations are available for reporting, monitoring, trend plotting, and exporting. For more information, download the Natural Gas Analysis Module flier. The EZReporter Natural Gas Liquids (NGL) Module is designed to perform standard Natural Gas Liquids extended analysis and reporting based on the GPA 2186-02 and GPA 2186-14 (and related) standards. The results from these calculations are available for reporting, monitoring, trend plotting, and exporting. For more information, download the Natural Gas Liquids Module flier. The optional Results Database Module allows you to capture results and save them in a local SQLite database. Results in the database can be searched by sample name and date range and can be batch re-processed for printing, exporting or trend plotting. For more information, download the Results Database Module flier. The EZReporter 4.0 Modbus Module is an optional module that adds Modbus TCP Slave functionality to any of the EZReporter 4.0 editions. Most numeric results that are calculated and reported in the edition of EZReporter you are running can be assigned to a Modbus register for a Modbus Master to read. EZReporter 4.0 is designed for operation under Windows 7 Professional (32 and 64 bit), and Windows 10 Professional operating systems. The Full .NET 4.0 Framework must be installed before trying to run EZReporter 4.0. The .NET Framework will be installed automatically, if necessary, when you install the software from the distribution CD or use the single-file installer. If you use the web-based installer the .NET 4.0 Framework will be downloaded automatically if necessary. Contact Diablo Analytical for information on how other data systems may be able to be supported. Please download the EZReporter 4.0 Price List for pricing information for all editions, add-on modules, upgrades, and software support. Click the link to purchase a license for the Data Analysis Edition, Standard Edition, NGA Edition, or NGL Edition from our web store. *Unless indicated otherwise, prices are for a one-computer, one-instrument license. New EZReporter 4.0 licenses (including upgrades from EZReporter 3.0) will include one year of software support. During the support period you will be able to install all upgrades of the EZReporter software (including major upgrades). Once your software support has expired, you will not be able to install any upgrades released after the date your support expired. However, you will be able to continue to use your existing version of the software – you just won’t be able to install any later upgrades until you renew support. The price to renew annual software support is 25% of the price of a new license for your edition and options. Support renewal will take effect from the end date of the expired/current subscription, regardless of when the renewal is purchased. This software is distributed as a fully functional 30-day trial application. The trial version has all of the features of the registered version, but you will be reminded that you are running the trial version with a "nag" screen each time you start the application. At the end of the 30-day evaluation period the application will no longer function unless you purchase a license or request a trial extension from Diablo Analytical. After purchasing a license, you will be provided with a serial license code that allows you to activate the software. See the EZReporter License Manual for more information. Note: All modules are present in the EZReporter program and all are active during the trial period. Once you activate the software license, only those modules that you licensed will be available. Visit our web store to purchase new licenses of the Standard Edition, Natural Gas Analysis (NGA) Edition, or Natural Gas Liquids (NGL) Edition. For software upgrades, support renewals, or to purchase using a purchase order from an approved company, Contact Diablo Analytical directly. Latest Announcements - Check the latest announcements to see if your question might have been addressed by a software update or other communication. Support Forum and FAQs - Check the EZReporter Support Forum or Frequently Asked Questions to see if your question might have been answered. You can also post your question to the support forum where technical support personnel and other users can respond. Software License Activation - Learn how to activate your software and submit an activation request from our online activation request form. Other Support Options - Visit our Product Support page to see the other technical support options that are available.